Portable Electric Space Heaters are a great way to stay warm during those cold winter days. However, there are a few important safety guidelines that you should know when using them. 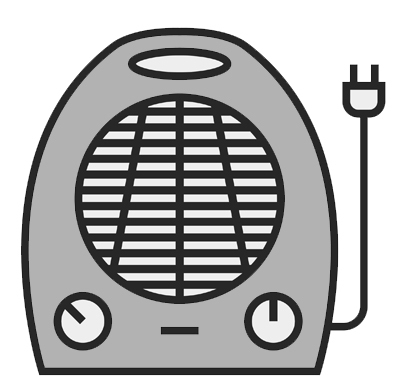 Portable electric space heaters manufactured after 1991 include many new performance requirements to enhance safety. For portable electric heaters that could present a fire hazard when tipped over, a tip-over switch will turn the heater off until it is turned upright again. New heaters also include indicator lights to let users know that the heater is plugged in or is turned on. Some manufacturers have included technically innovative safety controls such as infrared or proximity sensors, which can turn a heater off when objects come too close, or when children or pets are near. These kinds of controls may prevent burn injuries to children who might play too near a heater, or reduce the risk of ignition of combustible materials that could contact the heater. Unless certified for that purpose, do not use heaters in wet or moist places, such as bathrooms; corrosion or other damage to parts in the heater may lead to a fire or shock hazard. Do not hide cords under rugs or carpets. Placing anything on top of the cord could cause the cord to overheat, and can cause a fire. Do not use an extension cord unless absolutely necessary. Using a light-duty, household extension cord with high-wattage appliances can start a fire. If you must use an extension cord, it must be marked #14 or #12 AWG; this tells the thickness or gauge of the wire in the cord. (The smaller the number, the greater the thickness of the wire.) Do not use a cord marked #16 or #18 AWG. Only use extension cords bearing the label of an independent testing laboratory such as U.L or E.T.L. where testing of consumer electronics and appliances is done to the required standards. Be sure the plug fits snugly in the outlet. Since a loose plug can overheat, have a qualified electrician replace the worn-out plug or outlet. Since heaters draw lots of power, the cord and plug may feel warm. If the plug feels hot, unplug the heater and have a qualified repairman check for problems. If the heater and its plug are found to be working properly, have the outlet replaced. Using a heater with a hot cord or plug could start a fire. If a heater is used on an outlet protected by a ground fault circuit interrupter (GFCI) and the GFCI trips, do not assume the GFCI is broken. Because GFCIs protect the location where leakage currents can cause a severe shock, stop using the heater and have it checked, even it if seems to be working properly. Broken heaters should be checked and repaired by a qualified appliance service center. Do not attempt to repair, adjust or replace parts in the heater yourself.